As your kids get older, the toys they want for their birthday get more expensive. My daughter let me know that what she REALLY wants is a car. But she would be happy with the same present she has asked for at every gifting opportunity for the last couple of years: an iTunes card. This is a relief, because shopping for her is no longer easy. She has her own taste in clothes, in music, in games, in entertainment. “Next year, I will be an adult,” she tells us. As if we need to be reminded that she is all grown up. Almost all grown up. “Next year, I will be moving out of the house,” she says. I will worry about that next year. This birthday snuck up on me. Maybe I have been in denial, but by the time I realized it was close, it was too late to order a custom card. She drove my car to school yesterday; so I did not get a chance to sneak out to the mall until late afternoon. I used to be able to find plenty of good cards at the Hallmark store. Alas, while there were plenty of cards for daughters turning 16 and 18 and every year younger, I could find nothing for 17. The humorous cards were all inappropriate; better suited for people heading toward middle and old age than a newly minted young adult. 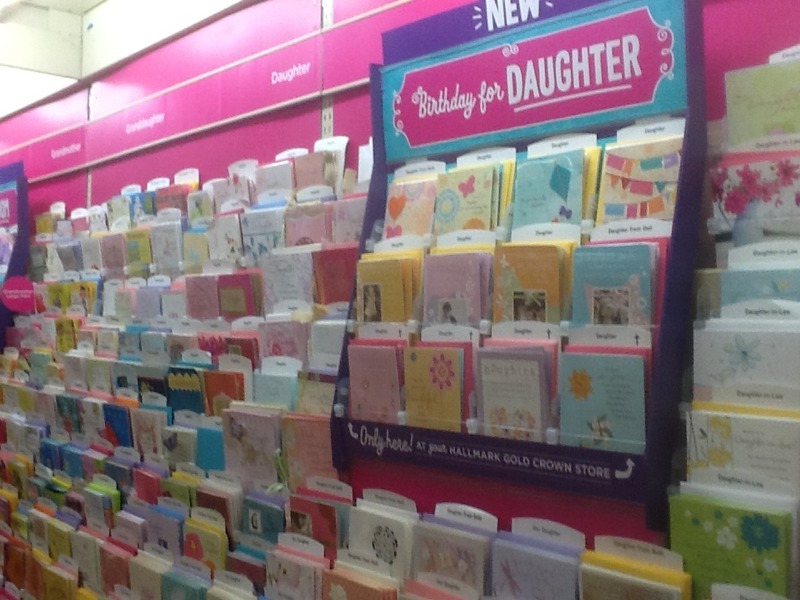 So I ended up in the aisle with the mushy cards, addressed to daughters, each one more sincere and flowery than the next. The kind of cards I never buy. And as I scoured the rack to find something that might sound a little like US, I started to cry. Yes, she was the most amazing child. Yes, we cannot imagine our lives without her. Yes, we are so proud of the young woman she has become. I got the prettiest, simplest, most direct one of the bunch, held back the tears and got the hell out of the Hallmark store. And hope next year doesn’t come too quickly. One more birthday, another year older…HURRAY! Aw, poor mom. I would’ve been emotional, too. I also would’ve grabbed a bottle of wine while I was out. 🙂 On a brighter note, you still have one more year! Happy birthday to your young woman. I hope you both have a wonderful day. Everyone’s kids are getting so old (good thing us parents aren’t…).